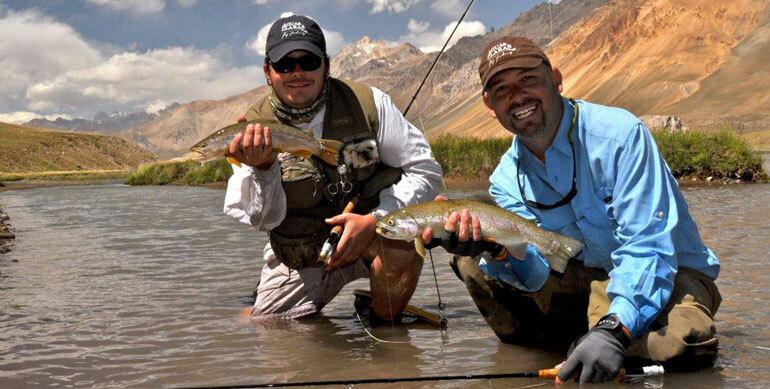 There are diferent options like rivers, lakes and fast water creeks, those places are great to fish with small nymphs and dry flies with delicate tippets, many stone and mayflies under the rocks due to the quality of the water that flows through the Andes. 480 km away from Mendoza city, located in the southern area of the province, you will enjoy amazing landscapes in one of the most beautiful areas in western Argentina. You will find lots of rivers, creeks and lakes, all of them real close to Las Leñas Ski Center. Excellent fishing, you'll have the chance to fight with rainbows, browns and Brooks, with a real chance of a great size trout. The fishing chances, the quality of the trout and the surroundings, makes it a very special place that you must know.